due to the gravitational interactions between the moon, sun and earth. Tides are essentially long, slow moving waves created by the gravitational pull of the moon, and to a lesser degree, the sun. Tides can be thought of as standing waves. The action of the tide is generated by these gravitational attraction forces which cause the water in the oceans to be pulled towards a nodal (focal) point directly below the Moon and the Sun. The tidal range for any particular site is determined as the difference between the highest high tide and the Lowest Astronomical Tide (LAT) datum. The HAT and LAT levels will not be reached every year. LAT and HAT are not the extreme levels which can be reached, as storm surges may cause considerably higher and lower levels to occur. Tidal range varies from place to place, in Australia the largest tidal range occurs on the North West Coast where the Highest Astronomical tide (HAT) exceeds 10 metres. 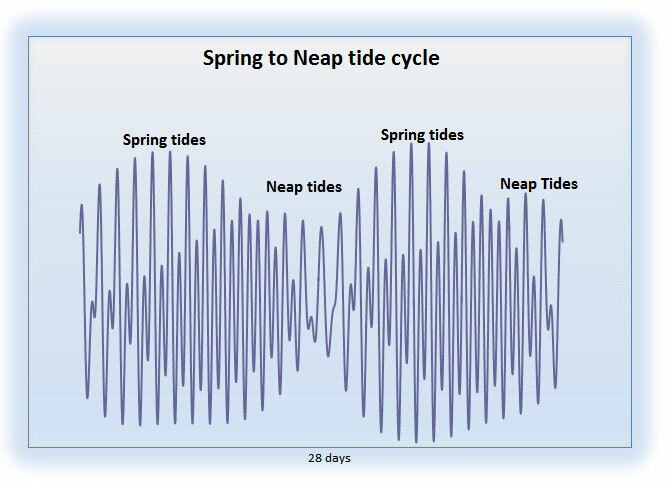 The Spring-neap tidal cycle over 28 days. Copyright Marine Science of Australia, all rights reserved. The tide cycle can be separated into two general types by the level that is reached at high and low tide. Spring tides are characterised by higher high tides and lower low tides than the neap tides. What causes the Spring-Neap cycle? Together, the gravitational pull of the moon and the sun influence the Earth’s tides. When the sun, moon, and Earth are aligned (at the time of the new or full moon), the solar tide has an additive effect to the lunar tide, creating extra-high high tides, and very low, low tides these are called spring tides. When the sun and moon are at right angles to each other, the solar tide partially cancels out the lunar tide and produces moderate tides known as neap tides. During each lunar month, two sets of spring and two sets of neap tides occur. Copyright Marine Science of Austalia, all rights reserved. The above animation shows the relative positions of the Earth, Sun and Moon through one tide cycle, however the daily tidal movements and Earths rotation are not represented. The tidal bulge is somewhat exagerated in this animation, on the real earth the oceans are not continuous hence the bulge is irregular in comparison. Note that the relative position of the sun in the above animation is incorrect. The Sun should be to the left so that when the moon is between the Sun and the Earth it is a new moon. All tides are composed of both diurnal (once a day) and semi-diurnal (twice a day) components. Diurnal tide cycle with one tide each day. Copyright Marine Science of Australia, all rights reserved. A semi-diurnal tide occurs generally when there are two high waters (tides) and two low waters (tides) per day. Typically the time between each successive high or low tide is 12 hours 25 minutes, this is half of one lunar day. 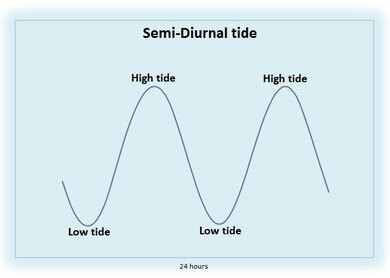 Semi-Diurnal tide cycle, with 2 high tides and 2 low tides each day. Copyright Marine Science of Australia, all rights reserved. 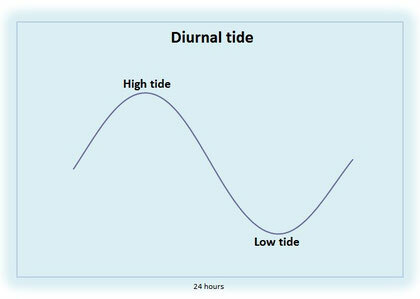 The most common type of tidal signal is a mixture of both diurnal and semi-diurnal signals this creates a mixed tide. Tidal currents are the alternating horizontal movement of water associated with the rise and fall of the tide. Tidal currents are caused by gravitational interactions between the Sun, Moon, and Earth. Tidal currents are periodic with a net velocity of zero over the particular tidal cycle. In the deep open ocean maximum tidal currents tend to parallel the high tide and minimum current speeds are associated with low tide. When the tide wave enters shallow coastal waters friction with the bottom slows the current and the maximum is then delayed to be mid way between the low and high tide. When the tide is rising and the flow of the current is directed towards the shore, the tidal current is called the flood (tide) current, and when the tide is receding, it is called the ebb (tide) current. King tide is a popular term for an especially high tide, such as a perigean spring tide. King tide is not defined in scientific terms, nor is it used in a scientific context. Use of the term ‘king tide’ originated in Australia, New Zealand and other Pacific nations to refer to an especially high tide that occurs only a few times per year. The term has now come to be used in British Columbia and the United States as well. In Queensland the term King tide refers to the highest tide in any one year. The term has in recent times been extended, particularly by media sources, to include any particularly high tide. A King tide refers to the tide level only and as such anomalies in sea level due to non-tidal factors are not defined as King tides. What causes a King tide? In a lunar month the highest tides occur at the time of the new moon and full moon, when the gravitational forces of the sun and moon are in line. These are called spring tides and they occur about every 14 days. In any one year there will be two spring tides that are the highest, one during summer the other during winter. These are often referred to as king tides. The king tides occur because of the combined influence of a number of astronomical factors related to the Sun and the Moon, and their alignments relative to the Earth. The earth moves around the sun in an ellieptical orbit that takes a little over 365 days to complete. The sun has an influence on the tides. The sun's gravitational force is greatest when the earth is closest to the sun called perihelion (and in summer in Australia) and least when the sun is furthest from earth called aphelion (in Australias winter). The moon has a larger influence on tide levels than the sun. The moon orbits the earth in an elliptical fashion taking around 29 days to complete. The gravitational force of the moon at the earths surface is greatest when the moon is closest to the earth called perigee and least when the moon is furthest from the earth called apogee around two weeks after perigee. The king tides occur when the earth, moon and sun are aligned at perigee and perihelion. The combined effect of the moon's phase and the varying gravitational forces of the sun and moon result in the highest of the spring tides occurring during the summer months of December, January and February in Australia and also in the winter months of June, July and August. During neap tides there is often very little movement of water at specific locations. These breaks in tidal movement can last up to 24 hours with little or no water movement. This phenomenon has been described by Chapman(1936) in the Official Yearbook of the Commonwealth of Australia of 1938. Professor Sir Robert Chapman named the effect “The Dodger” due to the apparent impossibility of saying when the tide will be at this particular period. Dodge tides (circled) where the water level doesn't change for 6 to 12 hours. The tide predictions are for 2012 at Port Stanvac in Gulf St Vincent South Australia. While dodge tides occur in a number of locations worldwide and in Australia, the term 'dodge' is used only in South Australia. The dodge tide is seen in Gulf St Vincent (in South Australia), where the amplitudes of the main semi-diurnal tide constituents are almost identical. At neap tides the semi-diurnal tide is virtually absent, resulting in an extended period of slack water occurring twice a month. This effect is accentuated near the equinoxes when the diurnal component also vanishes, resulting in periods of slack water. Other places in Australia where the dodge tide effect is evident include: Groote Eylandt in the Northern Territory, Portland in Victoria and Cape Ferguson in Queensland. Tide predictions are generated via a mathematical process by which the times and heights of the tides are determined in advance from the harmonic constituents at a place. The tide predictions can also be referred to as "tide tables, tide times, tides, tide predictions or tide charts". How are tide predictions generated? The tide prediction method used today in Australia is called harmonic analysis. The ideal tide curve for any given port is represented as an average height Z0 plus a sum of terms (constituents) each of which is of the form f(t) = H cos(at + \phi). The time t is measured in hours, and f comes out in metres. The numbers H,a,\phi are the amplitude, the speed and the phase of the constituent. The speed is given in degrees/hour, and the phase in degrees. Different constituents have different speeds, which are sums and differences of small integral multiples of 5 basic astronomical speeds. Information on: "Tidal Range" has been modified from: http://www.msq.qld.gov.au/Tides/Notes-and-definitions.aspx, © The State of Queensland (Department of Transport and Main Roads) 2009. "King tide" and "What causes a King tide" has been modified from :http://www.msq.qld.gov.au/Tides/King-tides.aspx, © The State of Queensland (Department of Transport and Main Roads) 2010–2014.